Puma watched Lapinette and the Wabbit until the key pulled them up the centre of a spiral staircase, then he bounded upstairs at unstoppable speed. The key started to change colour but its every movement was measured. It cared neither for the Wabbit nor Lapinette but only for its inexorable and pre-determined path. Stuck to the key, the two were helplessly towed in its wake. Suddenly there was a feline scurrying from above and Skratch the Cat appeared from the roof. Somewhat dishevelled and panting from his journey, he looked with horror at the scene. "Puma?" he asked. "They’re stuck to the key and they don’t seem to care," growled Puma. "It’s not like them at all." Skratch’s ears vibrated. "The key is exerting some strange force," he said. "I can feel it too." Puma looked across at Skratch for direction. 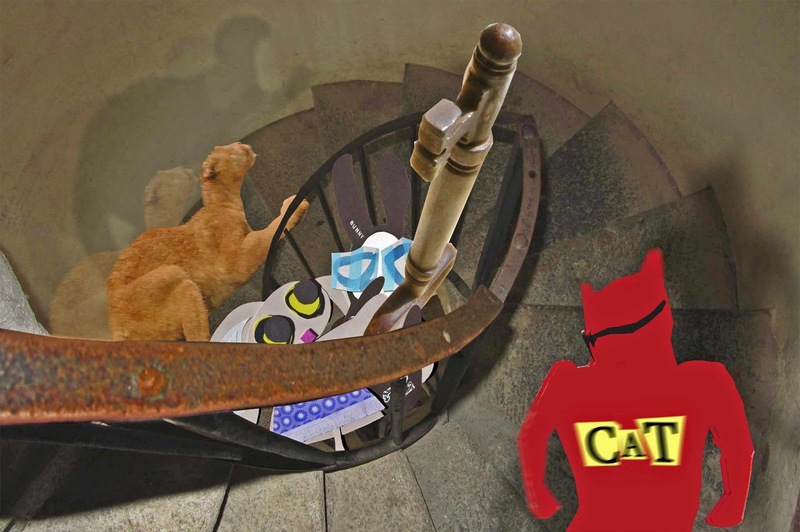 "We’ll scamper to the top and wait there," said Skratch. "That’s where it’s going." "Maybe there’s a door," said Puma. "If we can find it, we can stand in front of it and stop them." "That key isn’t stopping for anything," said Skratch, "and there’s one more problem." "Another problem?" groaned Puma. "In stories, there’s seldom just one key," purred Skratch. Puma growled again. "How many?" Skratch shook his head. "Three!" he sighed.